Nate lives in a tiny town where masculine success is measured in athletic prowess or sheer grunt – perhaps a bit of both – but never in creative potential. Nate's brother is the epitome of small town triumph, while Nate's life is basically hell. How do you survive emotionally when you're the school's punching bag? And how can you find your true self when everyone seems to have already decided who you are? Only Nate can answer that. Then Libby moves to town and Nate luxuriates in the joy of having his first real friend. Life becomes almost bearable as the two share their passion for theatre. But Nate still wonders how he'll ever find happiness in his small-minded town. Then Libby has a brain wave. The plan is hatched: Nate will escape to New York, just for a day, and audition for a part in E.T, the Broadway musical. Of course, nothing goes to plan. 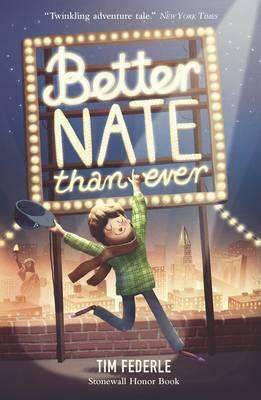 I adored Nate's quirky imagination, his ability to put a spin on the direst of situations and his heart-breaking awareness of the level to which he's a misfit. Each short chapter had me wondering if Nate would ever make it anywhere, let alone New York. With nothing to lose, thirteen-year-old Nate lays his tiny seed of self-belief on the line and with each step forward followed by three steps back, he bares a little more, not only of his dreams, but also his vulnerability. Better Nate than Ever is filled with the confusion that comes with not yet knowing your inherent worth or your sexual orientation. It's a treasure chest of musical whimsy and one-liners but running like a vein of gold deep beneath the surface lies the true Nate who will never give up his dreams. Better Nate than Ever is in my top ten of unique Middle Grade Fiction voices. No wonder it was a Stonewall Honor Book.